The Village began simply enough with this small log cabin. In 1981 Mom and Dad bought the first ten acres in Bull Skull Hollow. 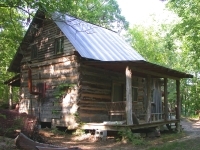 The following year, they discovered an abandoned house that had been built over a log cabin on some Tennessee acreage. 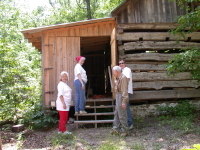 The planks of the house had preserved most of the log cabin. Both were avid collectors of primitive tools and implements, all of which were slowly filling their house and garage. The log cabin seemed the perfect way of displaying and using pieces from their collection. 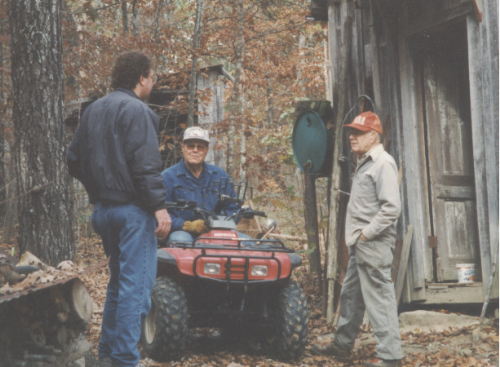 For three summers Mom and Dad worked preparing the log cabin for its move to Bull Skull Hollow, but after consultation with contractors, they determined it couldn't be moved intact. Instead, they contracted with a Tennessee man who hired Mennonites to tear down the cabin, move it to Alabama and reconstruct it. Watching the process taught them much about log construction. Throughout the 80's Mom and Dad haunted country auctions. Their collection of primitives grew, and needed a home. So they went back to the Tennessee property and moved the beautiful country barn to Bull Skull Hollow. Board by board they moved and rebuilt the barn. They worked together, teetering on ladders while the building grew. Made from a combination of hand hewn logs and sawn boards, it became home to many of their larger pieces such as wagons and tractors. 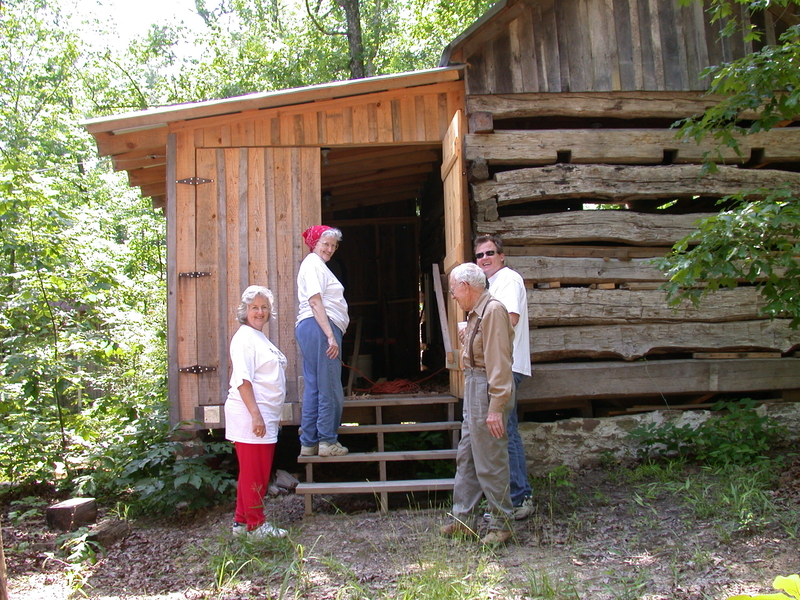 The log cabin and barn were both reconstructed without the benefit of electricity. There were no utility services that reached the property. The number of tools was growing, so a small tool house was built. It was the first building to be enclosed and put under lock and key. 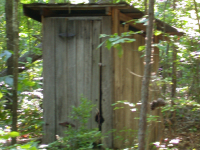 It was built in board and batten style in keeping with the style of the log cabin. 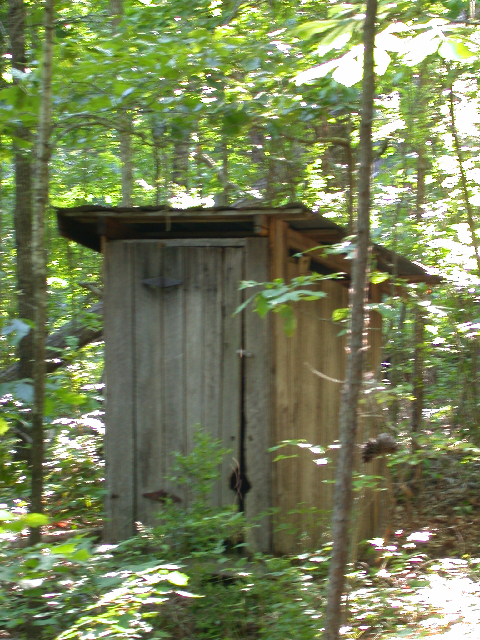 One of the necessities of life without utilities is an outhouse. 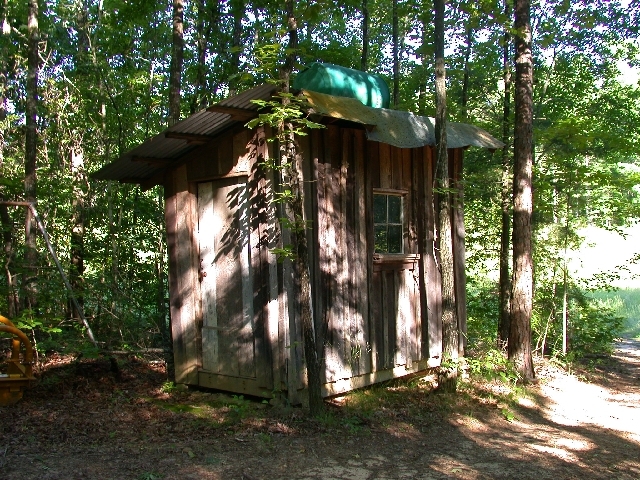 Another transport from Tennessee, this little building served their needs for several years. 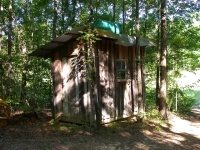 It is currently retired and provides home for wildlife, including a very large black snake. The bath house, another necessity of life, was built on site. Using 55 gallon drums, Dad set up a rain water collection system and a solar water heater. A claw foot tub was installed for a touch of luxury after a long day working. At an auction in Tennessee, Mom and Dad bought a salt log. Used for preparing meat for curing, a salt log is a huge log cut in half and hollowed out. The log they bought is 4' x 14'. When they got it home, there was no where to put it. 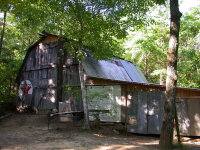 The narrow driveways they had hacked out would not allow the trailer to get near the cabin or barn. Dad covered the log and left the trailer where it stopped. With some innovative engineering he finally took a steel A-frame and a hoist to hold the log, and drove the trailer out. Then he built a building to shelter it. For several years that was their smoke house.